Recently, VVDN participated in the Town Hall held by Prime Minister Mr. Narendra Modi on October 24, 2018, on the occasion of the launch of the ' Main Nahin Hum' portal and app. The portal, which works on the theme ' Self4Society', enabled IT professionals and organizations to gather and share their efforts towards social causes and service to society, on one platform. 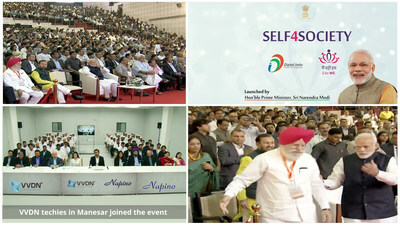 The event was all about our Prime Minister interacting and addressing IT & electronic manufacturing professionals and encouraging them to embrace the spirit of 'I to We' and 'Self to Society'. His message was for the young IT professionals who are leveraging the power of technology wonderfully and are using it not only for themselves but also for the welfare of India which is a great sign. VVDN team was present at the Town Hall event and VVDN Manesar team was watching the event live via Video Conferencing. Speaking on the occasion, Mr.Bhupendra Saharan, CEO of VVDN Technologies, said, "It was an honor and an inspiration to have Mr. Narendra Modi address the young talent in India. Today's youth has an unmatched energy and it is our responsibility to steer that energy towards building a better society." Working relentlessly to achieve its vision to be the Premier Indian Design and Manufacturing House for IoT Products for the world, VVDN is committed towards the upliftment of the society. The company today is engaged in several activities articulated towards Skill India, Digital India, Green India etc. VVDN's mission resonates with the Government in terms of promoting social start-ups. In addition from time to time, VVDN runs volunteering programs for its employees to come forward and contribute to help people in the aftermath of a natural disaster. Mr.Gourab Basu, General Manager Manufacturing, said, "It was great to have PM Modi hailing and volunteering efforts of the employees of tech companies for using technologies for the future growth & welfare of society." Further he added "participating through video conferencing was an amazing experience for the employees of VVDN watching our PM lives as he inspired and helped letting us know the activities of corporate social responsibilities." VVDN has registered on 'Self4Society' portal with a pledge to garner more and more support from its employees through volunteering programs to bring about a social and environmental transformation using skills and technology. VVDN Technologies is one of the leading Product Engineering, Cloud and Manufacturing Companies that is uniquely positioned to deliver versatile, innovative, world-class quality products. Company embodies real customer value by providing advanced engineering, cloud and manufacturing services through innovative cutting-edge technology. We work closely with our customers and partners to develop and manufacture commercially viable best-in-class products. VVDN's strong partnerships and alliances with various Silicon Companies has helped the company to stay ahead of the curve by developing cutting edge solutions for customers in various domains including Automotive, IoT, Networking, Cameras, Industrial space.